Aloe vera is not only a hardy plant capable of growing indoors or outdoors with little water, but also a handy solution to many needs. Aloe vera is reported to help reduce or relieve the following problems (used externally): psoriasis, rosacea, eczema, arthritis/rheumatism pain, eye/ear inflammation, canker sores, shingles, etc. Aloe vera is reported to help reduce or relieve the following problems (used internally): indigestion, upset stomach, constipation, irritable bowel syndrome, heartburn, congestion, stomach ulcers, colitis, hemorrhoids, urinary tract infections, prostate problems, cholesterol, triglycerides, anemia, obesity, diabetes, metabolic syndrome, etc. Decrease pigmentation/dark spots, age spots and freckles, fade stretch marks and brighten skin with aloe vera. Drink aloe vera to lower blood sugar levels. Prevent pimples and acne and reduce pore size with aloe vera. Prevent scarring and stretch marks with aloe vera. Promote faster hair growth by massaging aloe into scalp and letting set for 30 minutes before rinsing. Reduce puffy eyes by treating them with aloe vera. Reduce wrinkles, signs of aging, warts, etc., with aloe vera. Strengthen weak nails by massaging aloe vera into the nail beds daily. Treat athlete’s foot with aloe vera. Treat blisters with aloe vera for quick relief. Treat bruises with aloe vera. Treat insect bites with aloe vera to take the sting or itch out of them. Treat kitchen burns and mishaps with aloe vera, or mix with vitamin E for more major scalds. Treat rashes and allergic skin reactions with aloe vera. Treat sunburns with aloe vera to sooth and heal the skin. It is also good for acne, eczema, and other skin irritations. Treat your dog’s ears with dabs of aloe vera to clean, deodorize and acidify them. Use aloe drops in the ear to reduce ear aches. Use aloe in place of conditioner for silkier hair. Use aloe to remove eye makeup. Use aloe vera as a mild sunscreen. 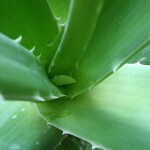 Use aloe vera as the main ingredient of mouthwash, hand sanitizer, deodorant, etc. Use aloe vera in the hair to fight frizz, style and soften hair, eliminate dandruff, sooth scalp, moisturize and detangle hair. Use aloe vera to remove eye makeup gently. Use aloe vera to sooth razor burn; it makes a good aftershave treatment. Or use it as shaving cream/gel for a close shave. Use aloe vera to strengthen gums and promote healthy teeth. Use as a moisturizer for dry skin, in place of creams and lotions.